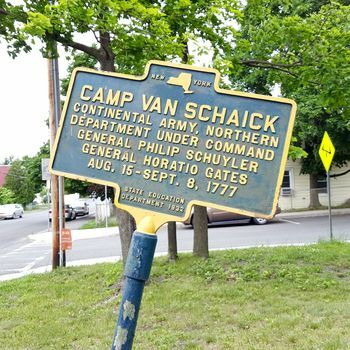 Camp Van Schaick (1777-1783) - A Revolutionary War Camp established in 1777 on Van Schaick Island, Albany County, New York. Abandoned in 1783 at the end of the war. Also known as Fort Half Moon (1). Camp Van Schaick Roadside Marker. 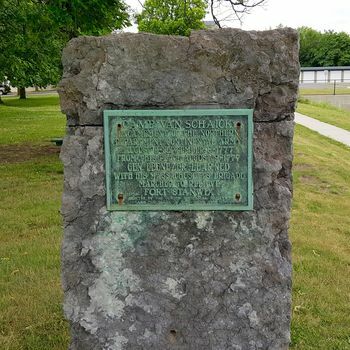 Camp Van Schaick Stone Marker. Established in 1777 by General Philip Schuyler on Van Schaick Island at the mouth of the Mohawk River. The island is surrounded on three sides by the Mohawk River and on the east side by the Hudson River. The fortification probably consisted of a blockhouse, barracks and surrounding entrenchments and was located on the high ground marked by the present day intersection of Park Street and Van Schaick Street. Below the camp on the east side facing the Hudson River is the Van Schaick Mansion built in 1735 by Anthony Van Schaick on a section of the “Half Moon” patent. In 1777 it was headquarters for General Philip Schuyler and General Horatio Gates. General Benedict Arnold started his Fort Stanwix seige relief column from this camp in mid August 1777. General Schulyer and General Gates did the planning here for the campaign to stop British General John Burgoyne at Saratoga. The Continental Army left Van Schaick Island and Peebles Island on 8 Sep 1777 for the campaign that resulted in the American victory at Saratoga on 17 Oct 1777. During the earlier French & Indian War the mansion had been the headquarters for Sir William Johnson, General James Abercromby and General Lord Jeffrey Amherst. Abandoned as a fortification in 1783 at the end of the war. The Van Schaick Mansion still exists operated by the Gen. Peter Gansevoort Chapter of the Daughters of the American Revolution. Location: Intersection of Park Street and Van Schaick Street, Van Schaick Island, Albany County, New York. Roberts, Robert B., Encyclopedia of Historic Forts: The Military, Pioneer, and Trading Posts of the United States, Macmillan, New York, 1988, 10th printing, ISBN 0-02-926880-X, page 587. This page was last modified 21:08, 7 January 2019 by John Stanton.